Last night, we met some Aspinwall-local friends for a dinner at the “new burger place” we’ve been hearing all about. Despite not accepting reservations, Burgatory Bar worked out well as a destination for the four of us. Burgatory – an obvious play on works of purgatory – has none of the pieces of being a true restaurant-hell. 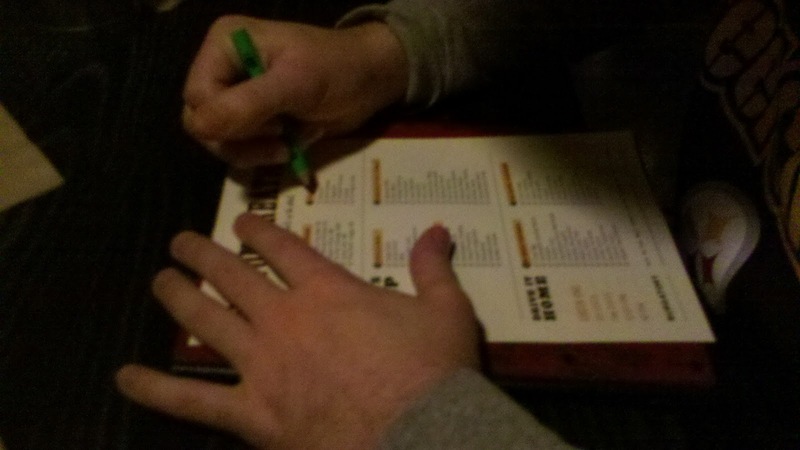 The draft selection was great, the servers were attentive and the food menu was mouthwatering. 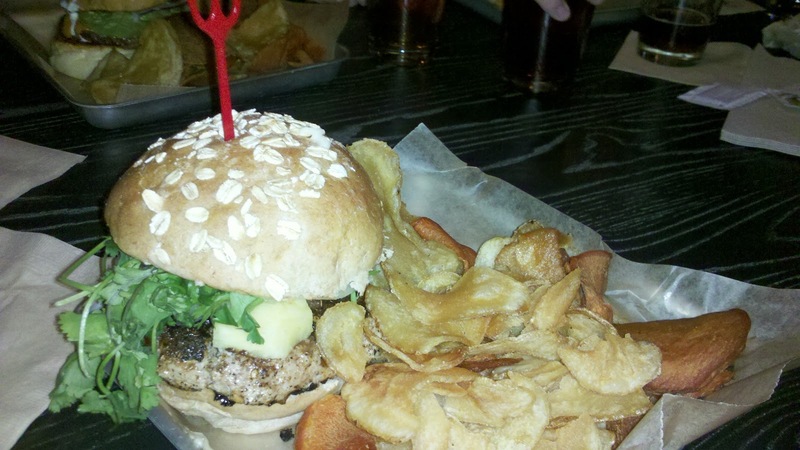 The model by which Burgatory is run isn’t a novel concept, but it is the first to use burgers as their focal entrée. Bites and Brews in Shadyside (and – I’m told – Fuel and Fuddle in Oakland) offer a very similar dining experience. After waiting for approximately 30 minutes for a table on a Friday night at 7:30pm, we were seated and all ordered varying beers. Our friends even noted that they found the selection to be a refreshing change from your typical restaurant. After a simple glance of the menu, we all were drawn toward different things. Our friends ordered the Morty’s Steakhouse and Buffaloed Bison. I ordered the What-A-Jerk Chicken Burger. Though TasteBudA decided that he was going to be more creative and build his own burger. Right at the table, in a checklist format, is the ability to check off ingredients and make your own burger – beef, bison, chicken, sausage, crab or veggie. I believe his selections included a bison burger with carmelized onions, sautéed mushrooms with some cheese. I added to the order with an appetizer of nachos, which looked like they were cooked directly on the plate and had a nice fire-kissed crisp to them. 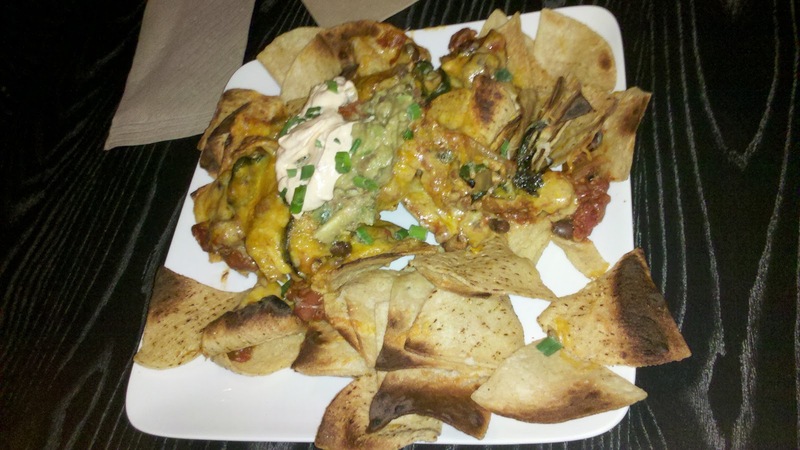 The toppings on the nachos were a little sparse, but perhaps that was on purpose to highlight the unique tortillas. My jerk chicken burger was served on a wheat bun and came with a mixture of sweet and russet potato chips. Though they come as a mixture, I would have preferred to have a full order of the sweet potato chips, because they were my favorite of the two. The burger was very well made and came piled with cilantro, which I’d never eaten in such a large amount. The flavors melded together quite well and I was pleased with my offering. 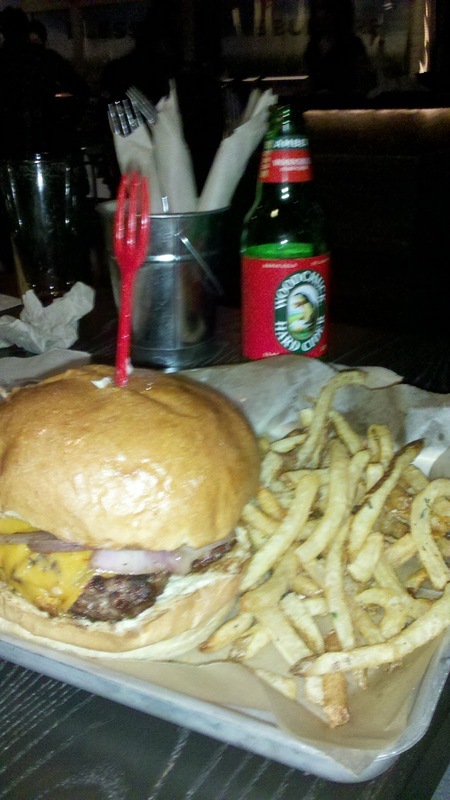 Along with his woodchuck ale, TasteBudA’s custom creation was a very good burger. After almost ordering the Full Monty bun, which really isn’t a bun at all – it’s a naked burger, he was pleased with the Brioche bun. The burger was cooked wonderfully and puts his previous favorite burger place to shame. Instead of chips, he regretted upgrading to the fries. They were severely over-seasoned, limp and somewhat soggy. He did not finish them. Our friends burgers looked equally as good, and being that Burgatory is directly next to the Waterworks Cinema, perhaps it will be a future stop for a dinner and a movie with TasteBudA. TasteBudA couldn’t leave without ordering one of the old-fashioned milkshakes. Now, Burgatory will likely first become known for their burgers, but second for their milkshakes. The milkshake may be old-fashioned style, but reinvented with new flavors. TasteBudA ordered the Caramel Pretzel milkshake to go, and drank it the entire way home. When I tasted his shake, it was unique. It has a taste that is exactly how it’s name says, but nothing as you would expect. It was a pleasant surprise, but I wouldn’t order this one if you are simply looking to satisfy a sweet tooth. All in all, the place was great. It is worth the short drive to Aspinwall and gave us the great opportunity to catch up with old friends.